Walk-through and hand-held metal detectors have become commonplace at schools, universities, event venues, government buildings and businesses in Kansas City and across the country. Their increase in popularity is due to the technology advances that make them an excellent component of any security system, as well as their ability to help proactively prevent losses versus react to them. More and more businesses are turning to walk-through and hand-held metal detectors to secure their facilities and protect their assets. Such is the case for Advanced Logistics and Fulfillment. Not only did Kenton Brothers install Garrett metal detectors to safeguard their facility and assets (both people and expensive components), but also their customers’ components housed inside Advanced Logistics and Fulfillment’s facility located in Kansas City. Advanced Logistics and Fulfillment is located underground, which makes the facility secure in ordinary circumstances. 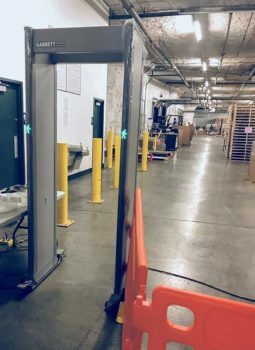 However, when this packaging and fulfillment company started working with a customer to provide services that involved expensive electronic components used in their packaging displays, a Garrett walk-through metal detector was installed in order to prevent them from leaving the Advanced Logistics and Fulfillment’s facility. Why a walk-through metal detector? Kenton Brothers’ associates listened to Advanced Logistics and Fulfillment’s goals and assessed the existing set up. We chose Garrett’s PD6500iä walk-through metal detector as the best solution to keep Advanced Logistics and Fulfillment’s customer’s electronic components secure. Preventing loss of the electronic components was a priority, but efficiency couldn’t be sacrificed. With Garrett’s PD6500i, Advanced Logistics and Fulfillment’s employees can still quickly get to their work areas without being held up by the metal detector at the entrance because the PD6500i’s accuracy results in fewer false alarms. Read the full case study. 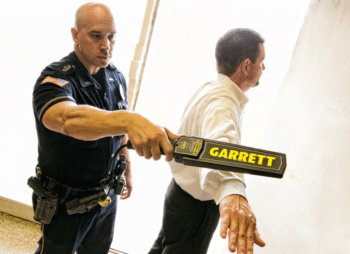 Even with all the benefits and efficiencies associated with metal detectors like the Garrett PD6500i, a commercial security system that includes metal detectors is only as good as the metal detector solution used and the company that stands behind that product. That’s why Kenton Brothers recommends, installs and services Garrett metal detectors, the gold standard in hand-held and walk-through metal detectors.